Save Our Post Offices Now! Save Our Post Office NOW! WE WON! Postal management has informed in writing that the “Approved Shipper” program in Staples stores will be shut down by the end of February 2017. This victory concludes the three-year struggle. The boycott against Staples is over! We salute and commend every member and supporter who helped make this victory! Without question, the big-business class — and their agents in the U.S. Postal Service headquarters, the executive branch and Congress — are on a path to dismantle the Postal Service, privatize the profitable parts of it, and neutralize or destroy the postal unions. Their whole economic system is in crisis. It’s not working. So the 1% are trying to pull their own chestnuts out of the fire by a full-bore attack on unions, the workers and the poor — an attack on our union contracts, our jobs, economic security, wages, benefits, conditions and social services. Their assault on the Postal Service is part of this strategy. It’s OUR post office. We pay for it. We need it. And together we can fight to keep it. Make the links with low-wage-worker and immigrant struggles, attacks on women, people of color, unions and all working people. Use resources from the right-side column “Take Action!”. Join the Staples protests: Pass resolutions; Spread the petition; Contact us for info in your area. 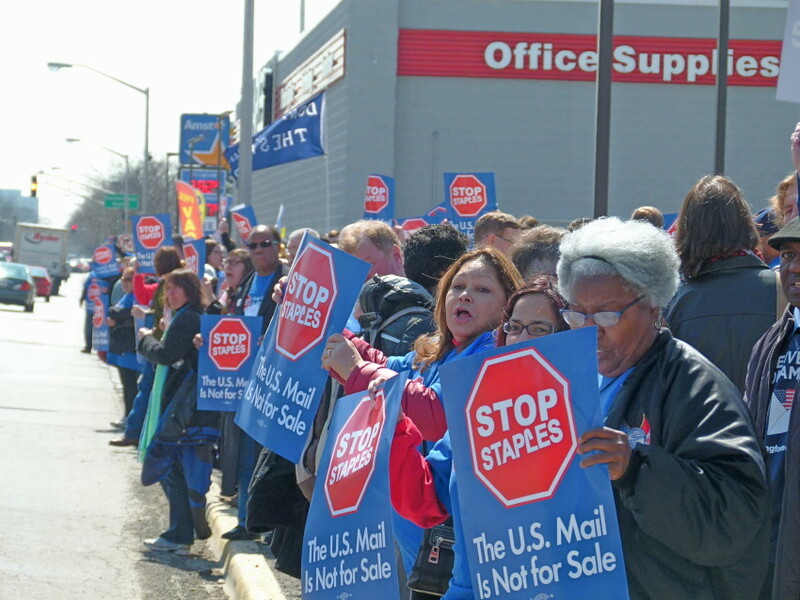 Stop Staples: The Us Mail is Not for Sale! They were protesting an ominous privatization agreement between this office supply chain and the U.S. Postal Service. The agreement would take work away from unionized postal workers and allow Staples, whose workers are low-paid and unorganized, to provide those services. This scheme would hurt not only postal workers. People who lose their neighborhood post office to Staples could then lose services altogether if the company, which is closing 225 stores nationwide, opts to close operations in a location with low overall sales. The right under federal law to a hearing before a post office is shuttered will be lost if a Staples store becomes the de facto local post office. 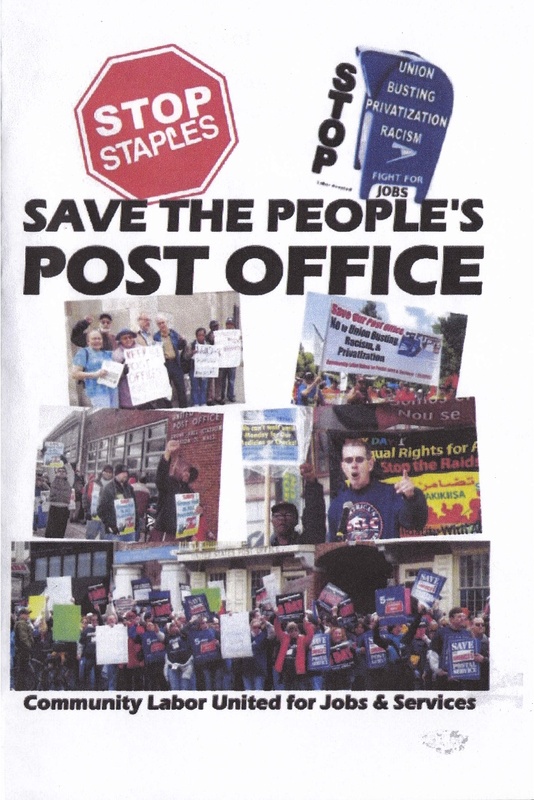 The struggle against the Staples plan has united four unions — the American Postal Workers Union, the National Postal Mail Handlers Union, the National Association of Letter Carriers and the National Rural Letter Carriers Association — in a “Grand Alliance.” Postal unions in other countries have voiced solidarity.